This is a Bernini 910 free arm Sewing Machine, made in Switzerland - widely considered the the Rolls Royce of sewing machine manufacturers. The machine includes a small selection of 7 practical and decorative stitches. A sewing table and hard carry case are common with these models and this item includes these too. Along with your standard stitches, the 910 also includes auto buttonholing, variable stitch width and length as well as a no fuss threat tension for reliable results every time. To top all of that off, the machine has 9 needle positions, half speed control, speed variation and sleeve arm facility. I also have the original accessory box, sewing feet, book, foot control and lead. To give you the peace of mind - this machine has had a full service by me a Bernini-trained mechanic and a sewing sample can be seen on this machine. The movement is extremely sweet and the machine is in exceptional condition for its age. I have no hesitation in saying it would give a lifetime of service and would be ideal as a proper workhorse for a student perhaps, or someone who wants to own an original top of the range machine. The machine also has a drop feed for free hand embroidery. 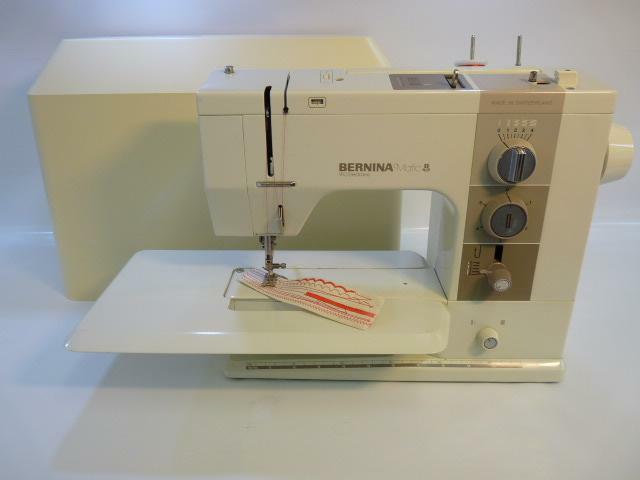 You will struggle to find a genuine Bernina 910 of this quality anywhere else on the market today! As you would expect the Bernina 910 handles as well as the day it was built and is a joy to use. Please note: This Machine has minor scratches and chips. Our monthly specials are this months best value sewing machines (or accessories) at fantastic prices. We offer both refurbished machines and new machines. Simply call us today for more information on any item listed including availability and delivery options. We offer a part exchange service on your machine when you buy any new or second hand machine from us. Enquire to find out how you could trade in your existing machines on a new purchase.